So last week i started seeing a new warning from Chrome. 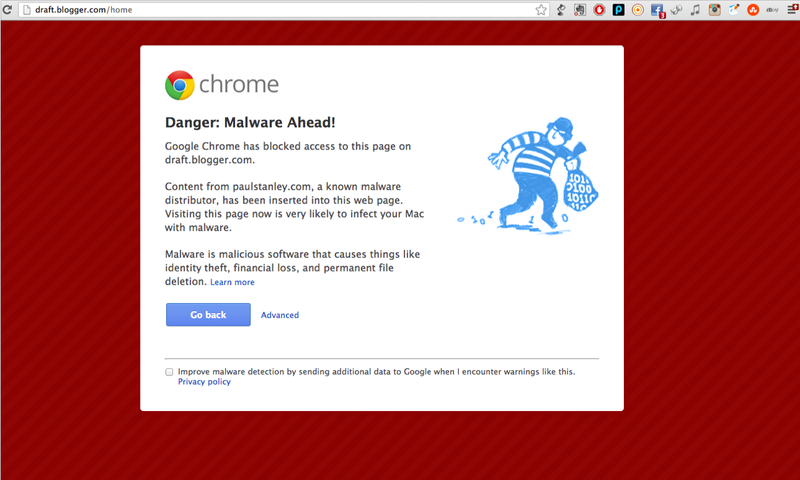 Danger: the site you are trying to access has known malware on it. The crazy part was that this was happening when i was trying to access blogger.com's dashboard (a google owned property). So after ignoring it for a while. Then switching to Opera Next as a way to access blogger.com and not get the warning. I finally did some searches on how to resolve the issue. Turns out when you follow other blogspots, posts from those blogspots appear in your draft.blogger.com dashboard. If those other sites got hacked or infected with Malware, Chrome will detect their malware content/ links and throw the Malware warning . This carries over to any site that is displaying some of the infected blogspots content. So the solution is to go to your draft.blogger.com folder and unfollow blogspots you are following. For me i was following only 2, so it was easy to remove both of them. After i removed both the blogspots, the malware warning stopped appearing.